TACOMA, Wash. (April 1, 2019) — Sacramento Republic FC suffered their first loss of the 2019 season, falling 2-1 to Tacoma Defiance on the road on Monday night. It was one of those nights for Republic FC whose lack of sharpness on the ball hurt them against a Tacoma Defiance side that started 10 players on loan from Seattle Sounders FC. Keven Alemán, making his first start for Republic FC since undergoing shoulder surgery in the offseason, nearly put the visitors ahead in the 41st minute. The Costa Rican collected a loose ball in the box off a cross, but fired his shot over the bar despite being unmarked. After a scoreless first half, Defiance took the lead in the 50th minute when Henry Wingo linked up with fellow Sounders FC teammate Will Bruin who played the attacker through on goal. 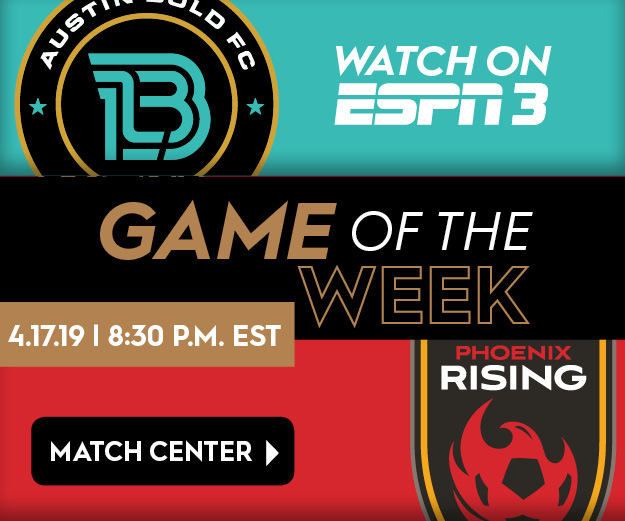 Josh Cohen came off his line, but Wingo fired a low, right-footed shot to the far post to beat the Sacramento goalkeeper and put his side ahead. Republic FC’s night was best summed up by a badly missed opportunity to equalize in the 76th minute. Tyler Blackwood made a driving run to the endline before squaring off a pass across the face of goal to an unmarked Drew Skundrich at the far post. Despite only having to tap the ball into the open goal, Skundrich’s touch failed him and the three-time NCAA champion skewed his shot over the bar. There’s a soccer truism that a goal missed is a goal against you and Bruin would prove its veracity when he capitalized on an uncharacteristic slip from Cohen just a minute later. The Sounders FC forward drove into the box and spun between two Sacramento defenders to fire off a low shot at the near post. Cohen got low to make the save, but the ball managed to slip below the keeper’s outstretched arms and into the back of the net. With three minutes left to play, Defiance defender Nicholas Hinds was called for a handball after failing to properly control a ball in the home side’s box. Cameron Iwasa stepped up to penalty spot and coolly slotted home his fifth goal in three games. Despite a late rally, Republic FC was unable to find the equalizer and suffered just their second-ever defeat against Tacoma. The club returns home to Sacramento for an April 6 home clash against league newcomers Austin Bold FC. Misconduct Summary: TAC – Daniel Leyva (caution) 22; SAC — Dekel Keinan (caution) 55. Sacramento Republic FC – Josh Cohen, Shannon Gomez, Charalampos “Haris” Chantzopoulos, Dekel Keinan, Mitchell Taintor, Elliott Hord (Villyan Bijev 54), Ray Saari (Drew Skundrich 52), Jaime Villarreal, Keven Aleman (Tyler Blackwood 71), Cameron Iwasa, Stefano Bonomo. Subs Not Used: Rafael Diaz, Matt Mahoney, Hayden Partain, Sam Werner. Stats: Shots: 15, Shots on Goal: 3, Saves: 4, Fouls: 9, Corner Kicks: 4, Offsides: 4. Tacoma Defiance – Trey Muse, Nouhou Tolo (Marlon Vargas 72), Jonathan Campbell, Roman Torres, Saad Abdul-Salaam, Jordy Delem, Henry Wingo (Shandon Hopeau 64), Handwalla Bwana (Nicholas Hinds 72), Alex Roldan, Daniel Leyva, Will Bruin. Subs Not Used: Alfonso Ocampo-Chavez, Jacob Castro, Joshua Atencio, Denso Ulysse. Stats: Shots: 18, Shots on Goal: 6, Saves: 2, Fouls: 13, Corner Kicks: 5, Offsides: 1.